This golden amber ale has a generous aroma of tropical fruit. The fruity flavour has hints of mangoes, oranges, lemons and sultanas. The pleasant floral hop balances this beer perfectly. It is a drying, warming, rounded ale to sip and savour at leisure. 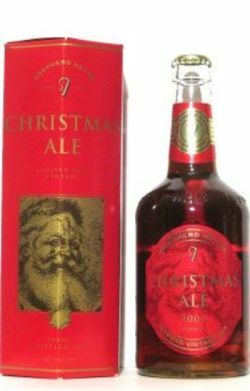 Christmas Ale 2006. Clear 500ml bottle, 5.5%. Best before end of September 2007, drank early November 2007, so just out of date. Poured into my Bateman’s straight half pint sleeve glass, twice. Light amber in colour, with an off white head, plenty of bubbles rising through the beer. Head shrinks too fast. The label claims it has an aroma of tropical fruits, it did smell fairly sweet, but I thought caramel (I often do) and flowery perfume. For a special Christmas brew it falls well short of a top winter warmer in my eyes, this is a good solid ale but it doesn’t carry enough taste, power or umph to make it stand out. I detected oak within the aftertaste and I enjoyed the beer, but not enough to buy another if I see one. (Bottled, rated 2006-12-03 16:15:12) Clear, deep copper with a smallish, fading and big-bubbly head. Sweetish, candy-fruity nose with pineapple and peach, and slightly nutty hops. Fruity-hoppy flavor with toffeeish maltiness, lightly metallic finish, not very hoppy. Medium body, soft palate, slightly lemonadey. A smooth and pleasantly fruity ale, but not interesting - let alone christmasy. UPDATED: JUN 13, 2012 Clear amber colour with not perfect off-white head. Good sweet and hoppy aroma when opening. Sweet malty aroma. Flavo. Malt and caramel, lightly bitter finish.. Bottle. Pours clear orange with at thin film. Aroma and flavoru are both vinious, fruity and a bit flowery. 50 cl bottle. Clear light brown colour with a weak head. Aroma of fruit, mango and lemons almost like a wine. Easy drinkable flavour with notes of fruit, sweet matl and some caramel. Bottled. Tasting @ Kolding Bryglaug. Aroma is fruity, malty with raisin, toffee and caramel. Clear, red amber coloured with an off-white head. Taste is sweet, malty, has raisin, caramel, toffee. Pleasant taste. Dark golden beer with a small white head. Toffee and caramel aroma. Dry and malty flavour, already strongly oxidized. Bottle @ thewolf-and-his-flock-of-sheep tasting session. Didn’t note the year, so might change. Anyway, I didn’t like it. Typical english smell, caramel malt, toffee. Boring. [email protected], tasting. ´Pours amber with a small white head. The aroma is malty caramel/toffee with a fruity note. Orange/berries. Bitter end with some dry hops. Medium bodied - smooth. Quite good!